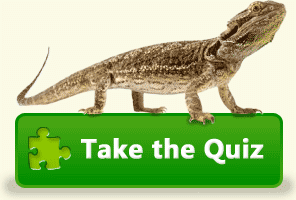 Test your knowledge of bearded dragons with our infamous bearded dragon test. Don't worry, if you know a lot about bearded dragons, you might do okay. Test yourself and see how you do! Need to find some information about bearded dragons? No problem! Our bearded dragon articles will give you everything you need to know about bearded dragons (it's also where all of our "Bearded Dragon Quiz" questions come from). Are you new to bearded dragons or do you want to understand a little bit more about them? No problem! Learn general information and details on bearded dragons, such as their history, life-span, and more. Bearded dragons come in many different sizes and colors. There are 9 different species of bearded dragons and many breeders have been able to breed dragons in a variety of unique color patterns. Take a look and you see the different types of bearded dragons that you can get for a pet. Want to buy a bearded dragon, but don't know where to start? No problem! Learn where to get a bearded dragon and how to choose a healthy bearded dragon by following a few easy tips. A bearded dragon's tank enclosure will be his/her new home for the next several years. Learn what size tank you need and what all you need to get to build a complete habitat that would make any bearded dragon happy. Bearded dragons can eat both plants and insects, but you still need to make sure they have a balanced diet. Learn what insects, plants, vegetables, and fruits a bearded dragon can eat and how to keep their diet healthy. If you've ever watched bearded dragons, you probably have noticed their amusing behavior such as head bobbing and arm waving. See why they do this behavior and learn what it means. Bearded dragons are pretty hardy animals, but they can still get sick. Learn what to look for so you can recognize illnesses in bearded dragons as well as what you need to do to keep a bearded dragon healthy. Bearded dragons are way too cool of a pet to have a boring name. This is why we came up with over 100 cool names for bearded dragons including dragon names from movies, books, and TV shows. Before you decide to get a bearded dragon as a pet, make sure you can afford it. We have outlined all the costs of owning a bearded dragon here so you know what to expect.